The Cancun (Mexico) Conference of Parties (COP) meeting is fast approaching this coming November. Like the failed COP meeting in Copenhagen in December 2009, the goal of the Cancun meeting is for governments to map out plans to "fight man-made global warming and climate change." While those climate bureaucrats are talking about "unequivocal warming" and "soon vanishing polar ice and rising ocean", nature is showing how wrong they are. As of July 29, the other day, global sea surface temperature (SST) as measured on NASA's aqua satellite, is falling deep and steep, much steeper than the 2008 global cooling and La Nina, especially for Nino 3.4 region of eastern Pacific. Another way of looking at the changes in global climateis to see the SST anomaly or "deviation from the average". Here, the blue color signifying SST anomaly (or colder than normal) of -1 to -2.5 C, even colder, is very clear in the southern hemisphere and south America. Date as of July 29, 2010 too. The climate negotiators or bureaucrats are meeting every two months, it seems. Last 2 meetings in April and June this year. Another meeting in August in Bonn, Germany. These are all preparatory meetings for the big global climate conference in Cancun. This is how big they are in Copenhagen last December. Wildfires are scorching a portion of California and other parts of the US at this time. Lots of houses got burned, but dead and burned people is low, if any. In South America though, the cold snap has already killed 400+ people this month in Peru and Argentina alone. When bitter cold and severe winter or prolonged global cooling strikes, people would wish and pray that "man-made warming" is correct and real. For now, it remains a fiction that thousands of climate bureaucrats and carbon traders rake in multi-billion dollars racket every year. A friend asked me if there is anyone in the new administration of President Aquino who can include some of MG advocacies, while the situation is still "fluid". 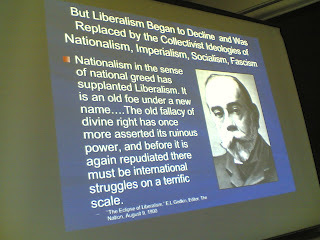 I said that if politicians in the Liberal Party -- the ruling political party now -- really understand and appreciate the liberal philosophy, as in classic liberal, not US "liberal" or Pinoy liberal or the left's favorite sloganeering, "neo-liberal", then there is no need to "put" someone in the administration to remind the President to stick to the party's principles and ideology. 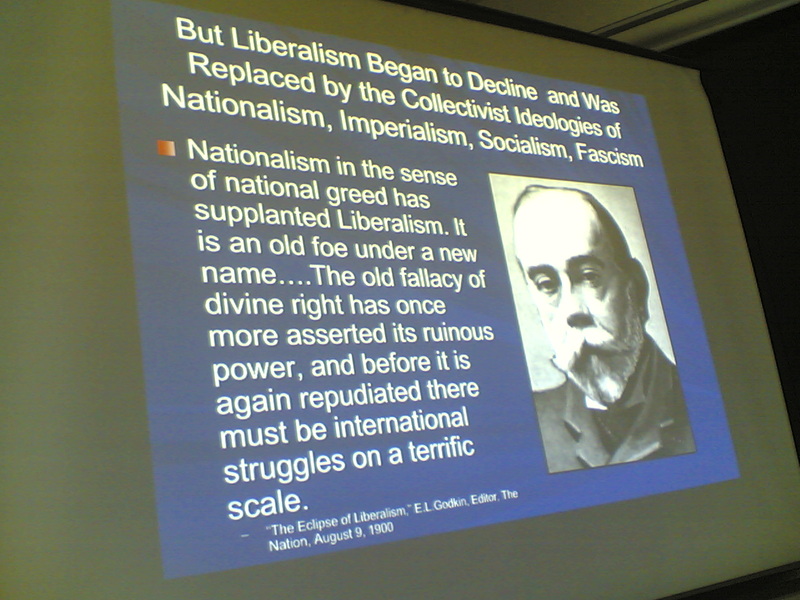 A liberal is not and will never be a socialist nor ultra-nationalist. A liberal is a lover of economic and political liberalization, of diversity. A socialist and nationalist, on the other hand, is a lover of monopoly, of monotony. I was actually disappointed how some Filipino liberal politicians would mouth socialist advocacies, like price control. Remember former Sen. Mar Roxas' drug price control moves last year. Or some moves by their partymates to support oil re-regulation legislation. Now the President seems to be more liberal than most LP politicians and party-leaders. It's good. I don't remember the party advocating to drastically slash and reduce the endless business regulations that kill entrepreneurship for some, that discourage free market capitalism in the country. But the President explicitly and loudy advocated for it. That is why I wrote "The President's SONA 2010" about bureaucracies in business. But more than "influencing" the administration, the bigger challenge for free marketers and believers of classic liberal philosophy, is influencing the public, in slugging out in public debates, the many socialists, millions of them in this country. Who are these socialists, by the way? Most would not admit that they are socialist and communist, but their advocacies are 99 percent similar to the explicit socialists. These are the people who think that "education is a right", "healthcare is a right", "housing is a right", "pension is a right", "agri credit is a right", "water is a right", "high paying job is a right", "unemployment allowance is a right". For them, everything is a right, an entitlement from the state. For them, there is little or no room for personal and parental responsibility. Most or everything should be government responsibility. My longer argument about this is posted below, "More statist than the state". Only the government can create or promote an even-playing field for all citizens (including legal entities). It is not just my belief, but it is THE government's obligation to do so. However, this obligation should not be misconstrued as 'enforcement of equality', which has tinge of socialism in it. Rather, I would expect that government ensures that everyone has an equal opportunity to do good in life, to pursue his happiness, etc. Truth be told, the private sector, left to its devices, cannot create this equality of opportunity. Lardy is right. There is one important function of government that I believe, and I would say that there should be BIG government in implementing it: to protect the citizens right to life, right to private property, and right to liberty and self expression. The promulgation of the rule of law -- the law against killing and shooting, law against stealing and plunder, law against kidnapping and carnapping, law against censorship and harassment, etc. -- is a very important function of the government. And for me, this is the single biggest function of government to ensure the equality of opportunity for all people. Juan is a hard-working and ambitious person, even if he did not reach college. He is a mechanic by day time, and sells balut/chicharon/ peanuts in the evening, comes home late at night. It won't be long and Juan will become a start up formal entrepreneur, on his way to wealth and being rich. Government's job is to protect Juan and his family from street muggers, thieves, snatchers, "akyat-bahay" gangs, and protect his wife and daughter/s from rapists. Juan has great peace of mind, he works hard, his savings and investment is respected and protected by the state. Pedro who is less hard-working but very articulate speaker and writer on "rights of citizens", also works to convince the state to confiscate more and more income and savings of Juan so that the state will have plenty of money to "fight poverty", along with the MDG soldiers of the UN. If the state will stick to its primary function of protecting the citizens' right to life and right to private property, the state should not become an instrument for income confiscation and wealth redistribution. All people should be encouraged to be hard-working and ambitious. For those less ambitious people, they should be encouraged to respect the wealth of other people, to be non-envious of the fruits of hard work of other people. How about taking care of the really poor, those who became poor because of natural circumstances -- their community was wiped out by a strong flash flood or volcanic eruption or earthquake or tsunami. Or impoverished by a bitter and prolonged clan war or civil war. Personally, I haven't heard of any very rich man/woman in this country or in the world, who is not involved in any charity organization or foundation. One reason is that there is deep happiness that those people feel and derive when they give away a part of their wealth voluntarily, without coercion by anybody. Another reason is that very rich people would be approached by their friends, acquaintances, former or current staff, to be involved in some charitable causes. There is one "politically incorrect" outcome of free market capitalism though: high inequality among people. But such inequality and its growing gap is a prduct of endless potentials, endless ambition and high work efficiency, of some people. The super-efficient will soon become very very rich, and this widens their gap with the middle class and the poor. Then there are certain groups of people who really have no ambition in life except to party and be happy everyday. They may work hard but they also party hard everyday, with little or negative savings. When emergencies emerge, they have no savings, so they borrow. Such initial indebtedness will soon become monster debt if they will not mend their ways. 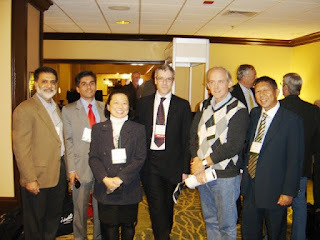 A good friend from Delhi, Barun Mitra (leftmost in this picture, taken last May 2010 in Chicago during the Heartland 4th ICCC) founder and Director of a free market think tank in Delhi, Liberty Institute (www.indefenceofliberty.org), wrote a new article in the WSJ, "We're All (Still) Socialists in India." "all Indian politicians are—officially—socialists. That's not a typo. During the height of Indira Gandhi's Emergency Rule in 1976, policy makers passed the 42nd Amendment to the Constitution, which added the words "socialist" and "secular" to the preamble. Then in 1989, the Representation of People Act, the law which governs elections and political parties, was amended to make it mandatory for all political parties seeking registration with the Election Commission to affirm not only the general constitution but also socialism. Since then all political parties have sworn to socialism without any hesitation, without bothering to define what it means." An attempt to strip the word from the constitution is far more important than semantics. I commented to him through our email discussion list, that perhaps the long-term action needed is an amendment to the Indian Constitution that will remove the word "socialist" and related connotations. But that itself will be a big political battle. It's like the Philippine Constitution, revised in 1987. So many professions -- physicians, nurses, dentists, accountants, lawyers, advertising, engineering, architecture, etc. -- are reserved only for Filipinos. But the Philippines has thousands of physicians, nurses, accountants, managers, engineers, moving abroad to practice their profession. And there is no Constitutional or legal ban in the many countries that they are working now. Clear double standard and hypocrisy in that provision of the Philippine constitution. While free market-oriented guys and institutes like Barun do their work, it is time and development in other parts of the world, especially in East Asia (China, Japan, HK, etc.) that will be their greatest ally. There should be growing realization that liberalizing the economy and politics is the long-term solution to poverty and underdevelopment. Back to the Philippines, there is high optimism in the country now with the election and pronunciation of the new Liberral President. He promise to significantly reduce the number of procedures, the number of requirements and pages, for business registration. Some huge ticket infrastructure projects (naval development, another expressway) are being pronposed with 100 percent private funding, via the built-operate-transfer (BOT) and related schemes. If there will be significant entry of foreign investors into the PHilippines again, the rest of Asia like India, will notice that. And they will be encouraged to follow suit. Legal and constitutional restrictions like reference to socialism will be slowly checked and reviewed. There are lots of US, European and Japanese investors that are on the look-out where they can jump ship, as the volume of taxes and new regulations in those countries keep rising, not declining. Asia should be the top destination. Another friend from Beijing added that in China, they write "under the leadership of the CCP Party", in compliance with four principles "Socialism, Party Leadership, Marxism and dictatorship of the proletariat" provided by the Constitution of China. So note there: the two biggest countries in the world with a combined population of about 2.5 billion people, are explicitly "socialist" based on their constitutions. 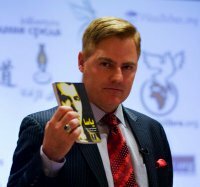 It is important, therefore, that such coercion in the constitution will not be strictly followed as it is entrepreneurship and capitalism that provides the economic dynamism that allows the two countries to grow economically and provide jobs to their more than a billion workers, managers and entrepreneurs. I was supposed to laugh at this rather weird law, but then a member of one of my discussion groups pointed out that the Philippines also has a law on state ownership of all waters, including atmospheric water. According to him, this is Presidential Decree (PD) No. 1065 or the Water Code of the Philippines. 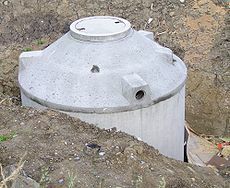 It provides that "rainwater falling on private lands belong to the state but any person who captures or collects water by means of cisterns, tanks, or pools shall have exclusive control over such water and the right to dispose of the same." So the State has taken over ownership and control of what nature gives to people. But at least in the Philippines, the government has not taxed people yet if they collect rainwater for their personal and household purposes. It is the concept of "dominium" from the Roman civilization, that State dominion over natural resources -- the rain, the ocean, the land, and minerals under the surface, under seabed -- is assured. The Regalian doctrine states that all lands belong to the State. This applies to all public forest land, government land, land below rivers, lakes and seas. There are lands that have been declared alienable and disposable (A&D land) by the state, and these have been titled under private individuals, private corporations and associations and other private entities. But owners of such land have to pay "rent" to the government, the local governments, in the form of real property tax (RPT). Failure to pay the tax plus penalties for several years will prompt a local government (city, municipality or province) to take possession and ownership of the land, and resell to other private entities or keep it as government property. The State also owns all minerals under the surface. Thus, if there are precious minerals under one's house, say just six feet below, the State can force him out of his lot, after paying a token of compensation that he may not agree to, then the State can demolish his house so that it and its mining concessionaires can quarry and get the minerals. In my earlier paper, "Water deficit and alarmism surplus", I argued that the recent "water crisis" was more of an engineering problem and not a climate problem. El nino occurs every 3-5 years, it is not a surprising or unforseeable event, it occurs in cycle. Also, I mentioned that there were reports that the water regulatory agencies released water last December 2009 equivalent to 3 months water consumption of metro manila, leaving little water for the first half of 2010. Magat Dam, picture taken from vistapinas.com. I also mentioned in the article my observation of Japan, where one river system will have up to 7 dams to impound and store water. Lots of water to draw upon even during the driest season. Compare that with only 1 or 2 dam/s, if any, for the various river systems in the Philippines. (yy pesos cost of drum) x (no. of drums per household) x (no. of households in the metropolis) and assumed that the cost should be lower than building another dam. 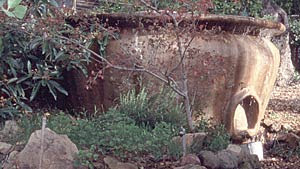 If you have a big house, then you can put as many drums of water in your backyard or spacious kitchen, etc. But if you live in a 30 sqm (or smaller) condo unit or apartment, each sq.m of space is precious for household needs, not to put drums for water storage. Also, when you store water in your backyard or kitchen, make sure it is 100% sealed at all times, otherwise you are hosting thousands of new mosquitoes right in your own house. Your house or your neighbor's houses will be a ground zero for dengue/malaria/ other mosquito-borne diseases. It is really dangerous. If 99 percent of all households that practice water storage through drums will make sure that their drums are 100% sealed at all times, but there is 1% or 0.5% of households who are irresponsible enough to leave their drums unsealed even for just 5 minutes/day, those households will be the biggest ally of mosquitoes in spreading dengue, etc. A cistern. Picture taken from wikipedia. Rainwater harvesting at the community level, say several huge tanks to collect rainwater to serve a village is fine. There should be some professionals who will do that work and apply appropriate technologies to kill mosquitoes inside those tanks. They key is involvement or supervision by some professionals, and not just anybody should store water in drums. I speak with experience. One of our neighbors before, an old man, store water in 4 drums in front of his house, "sakali may sunog, di na tayo maghintay pa ng bombero." Sounds logical, but not too logical. We were wondering why the mosquitoes would never go away. When that old man left the apartment, we threw the water in his drums, and saw thousands of kiti-kiti, those tiny little submarines that will graduate to become mosquitoes in a matter of days. My bet is still for the water companies to construct plenty of dams, small dams, in some rivers. Impound water at 700 meters elevation, another dam at 600 meters, another dam at 500 meters, another dam at 300 meters, another dam at 200 meters, and so on. Just one river and you have several dams to impound and store water. 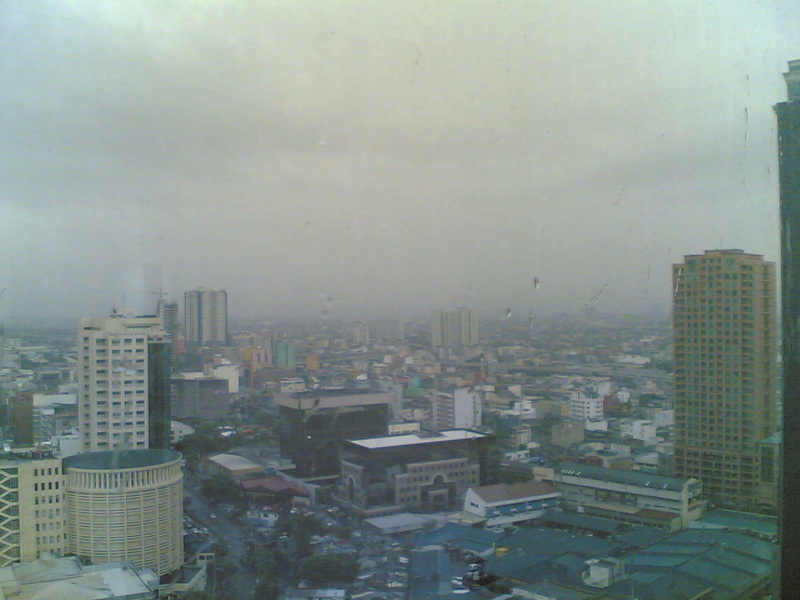 Metro manila's population is growing by about 200-300,000 people/year. Plus 1 to 2 million who live in nearby provinces of Bulacan, Cavite, Laguna, Rizal, Tarlac, Batangas, etc. who go to the metropolis daily or occasionally to work, study, do business, etc. The water companies can project the increase in demand and build the appropriate dams for long-term water storage, long-term solution. Besides, if we stop believing the man-made warming religion and read on our own other scientific blogs and websites, we will realize that the appropriate term is climate cycle, natural climate cycle. Not climate change, much less man-made climate change. Global warming-cooling- warming-cooling. Medieval warm period (warming), little ice age (cooling), past century's warming (peaked in 1998), cooling this decade and the next few decades. What to expect? more rains, more severe La Nina, more severe winter, with occasional drought and El Nino from time to time. The new President of the Republic of the Philippines, Benigno "Noynoy" Aquino, delivered this afternoon his first State of the Nation Address (SONA). He has been in power for only 4 weeks now. The Address is long, I will only make a few comments on some of the points he discussed. I really expected him to say something on reducing government bureaucracies for the entrepreneurs, the job creators, the capitalists, big and small. And I was not disappointed. Towards the middle of his address, he said, referring to the Department of Trade and Industry (DTI) and other government agencies like the BIR and SEC. "Ang walang-katapusang pabalik-balik sa proseso ng pagrehistro ng pangalan ng kumpanya, na kada dalaw ay umaabot ng apat hanggang walong oras, ibababa na natin sa labinlimang minuto. Ang dating listahan ng tatlumpu't anim na dokumento, ibababa natin sa anim. 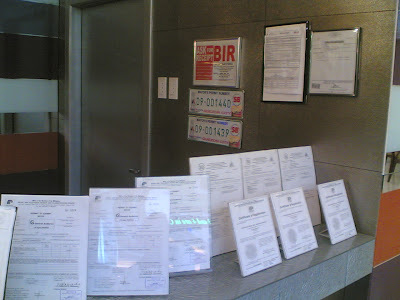 Ang dating walong pahinang application form, ibababa natin sa isang pahina." Translation: "The endless procedures in registering a business, which takes between four to eight hours per visit, we will reduce to 15 minutes. The old requirement of 36 documents, we will bring it down to six. 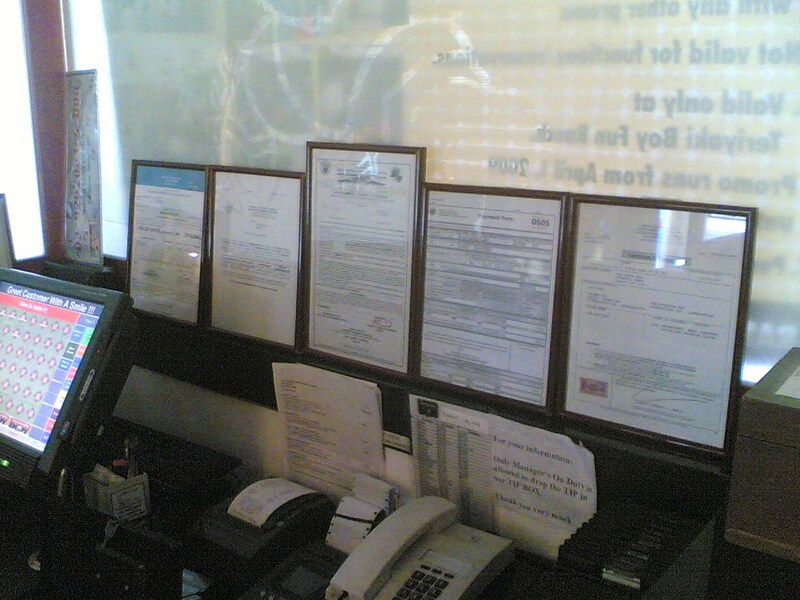 The eight pages application form, we will reduce it to one page." Bingo! Reduce the bureaucracies, reduce the number of signatures by government officials and bureaucrats, that alone will bring down corruption in the country. Some guys though, considered the President's SONA as "elitist". They blasted it as pro-big business, and hence, worsening the inequality in Philippine society. Consider this example. A group of OFWs with some savings wants to put up a micro-business, say a parlor or barber shop, or bake shop or internet shop or food shop. Various national and local government bureaucracies require them 3 to 4 dozens of different taxes and regulatory fees to pay every year, excluding the taxes and fees just to start a business. The President said this is wrong. The number of business regulations, the procedures in getting a business name, the number of pages of application forms, etc., should be drastically cut. Is this elitist? I don’t think so. It is pro-small busines, it is pro-big business too. When there are lots of bakeshops, lots of internet shops, lots of parlor/barber shops, lots of food shops, lots of jobs will be created. When people have jobs, they tend to become independent of government. They do not easily run to politicians and government welfare offices, they have the resources to take care of themselves, their families, friends and relatives. "Una, tutukuyin natin ang tunay na bilang ng mga nangangailangan nito. Sa ngayon, hindi magkakatugma ang datos. Sabi ng PhilHealth sa isang bibig, walumpu’t pitong porsyento na raw ang merong coverage. Sa kabilang bibig naman, singkuwenta’y tres porsyento naman. 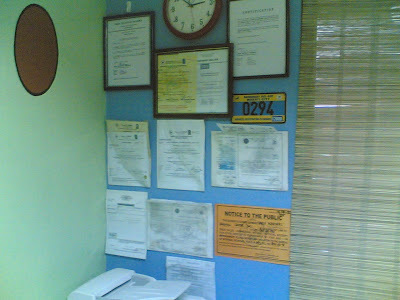 Ayon naman sa National Statistics Office, tatlumpu’t walong porsyento ang may coverage. "Ngayon pa lang, kumikilos na si Secretary Dinky Soliman at ang DSWD upang ipatupad ang National Household Targetting System, na magtutukoy sa mga pamilyang higit na nagangailangan ng tulong. Tinatayang siyam na bilyon ang kailangan para mabigyan ng PhilHealth ang limang milyong pinakamaralitang pamilyang Pilipino." "First, we will identify the correct number of Filipinos who sorely need PhilHealth coverage, as current data is conflicting on this matter. On one hand, PhilHealth says that eighty-seven percent (87%) of Filipinos are covered, then lowers the number to only fifty-three percent (53%). On the other hand, the National Statistics Office says that only thirty-eight percent (38%) of Filipinos are covered by Philhealth. "Even as we speak, Secretary Dinky Soliman and the Department of Social Welfare and Development are moving to implement the National Household Targeting System that will identify the families that most urgently need assistance. An estimated 9 billion pesos is needed in order to provide coverage for five million poor Filipinos." There are three significant things to note here. One, correct PhilHealth's exagerration of its actual coverage. I have written two papers in the past pointing out that PhilHealth was exagerrating the actual number of its beneficiaries. What PhilHealth does is to multiply each member (private employed, government employed, indigents, individually-paying, OFWs) by five. Thus, even a single, new college graduate with no dependent (no spouse, no kid, parents are either working and PhilHealth members too or parents are deceased or not working but below 60 yrs old, not qualified to be declared as dependent, etc.) is assumed by PhilHealth to have four dependents. This is lousy and simplistic math. So what happened is that for the 1st quarter of 2009 for instance, total number of members excluding the "lifetime members" or the registered senior citizens who are not pensioners somewhere, was 16.35 million. But PhilHealth's count of the number of beneficiaires was 76.69 million, or about 85 percent of the total population of the country. Lazy and simplistic math, really. I sent this and another paper to some PhilHealth officials and I was wondering why they did not correct me when I said that their office is exagerrating its number of beneficiaries. Now it is the new President of the country who expresses disbelief in their numbers. Two, no mention of the Department of Health (DOH) and drug price control policy, something that was among the highlights of the past President's last SONA a year ago. I hope that this is a signal that the President will soon abrogate Executive Order (E0) 821 by the past President imposing price control on certain medicines, starting mid-August 2009. I have also written a number of papers why the drug price control policy is a failure in improving access of the poor to more life-saving and disease-killer drugs, all posted in the MG website, www.minimalgovernment.net. And three, there is bigger role for the national government in providing healthcare for the poor. Before, the local government units (LGUs) need to put up a counterpart fund in financing the healthcare coverage of the really poor. Lots of problems encountered in that scheme as some poor LGUs cannot put up the counterpart fund. So the next tack of the national government is to solely shoulder the cost of healthcare of the really poor. Now they are targetting some five million households, roughly about 25 million individuals, to be covered by PhilHealth. Further nationalization of the service is not a wise move. There is a new development in UK's healthcare where the UK government will decentralize its socialized and nationalized healthcare system, as reported in this story. Of course decentralization does not mean privatization. It only means to transfer the function of healthcare delivery from the national government to the local governments. There is realization that too much bureaucracy at the national level impedes health delivery to the public. Finally, my position on healthcare is that it is first and foremost, a personal and parental responsibility, not government responsibility. Government role is most needed in limited cases like the spread of infectious diseases. People should not drink and drink, smoke and smoke, eat and eat, and when their internal organs are dilapidated by such vices or their blood vessels are choked by fat, they just run to the government to demand that "health is a right." Parents and guardians should also teach their kids to wash their hands well before they eat, or to keep their house and surrounding clean so that the rats and cockroaches will not hold daily and nightly general assembly in their place. That's a whole decade of hotness in there." I commented that NASA's GISS (Goddard Institute for Space Studies), the department under NASA that generates this kind of study, along with the IPCC, the World Meteorological Organization (WMO), Al Gore, other groups (Greenpeace, WWF, etc.) 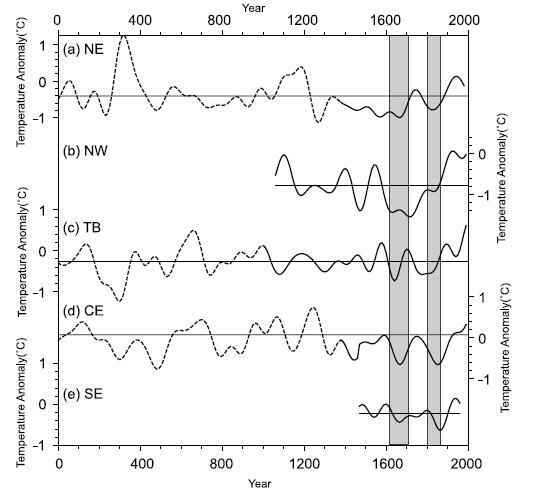 would love to (a) use 1880 or 1850 as starting period, (b) use surface station temperature data. They do not or hardly use: (i) past 1,000 or past 10,000 years temperature record, (ii) sea surface temperature (SST) and tropospheric temperature data. (a) there was period in the past, the medieval warm period (MWP) especially, which was much warmer than the past century's warming. (b) there was a "little ice age" (LIA) that occured in the past 400 yrs (maundeer minimum) and the past 200 yrs (dalton minimum) where global temperatures plunged. (c) using 1850 as starting year of temp. comparison is taking the period were the world was emerging from global cooling, the LIA, and starting a new round of global warming. (d) it's a global warming-cooling-warming-cooling natural cycle, none of it was man-made, never. The past century's warming has precedent, it was never ever "unprecedented". The peak of past century's warming was 1998. 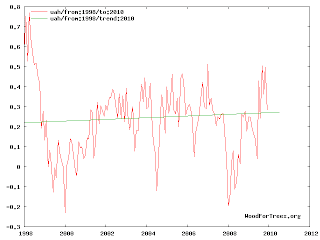 Since then, global temperatures have either fallen or plateaud. "Global temp." here, as measured by tropospheric temperature from satellite data, is the average of the temperatures for the northern hemisphere, southern hemisphere, and the tropics. The term "climate change", like "man-made warming", is junk. "Rainwater equivalent to more than a fourth of the volume brought in six hours by last year’s killer Tropical Storm “Ondoy” (international codename: Ketsana) was dumped on Metro Manila in just two hours Sunday afternoon." Meaning if those 2 hours of rains yesterday extended for another 4 hours to equal typhoon Ondoy's 6 hours of rains last September, that should have been equivalent to 3/4 of the rainwater dumped by Ondoy. 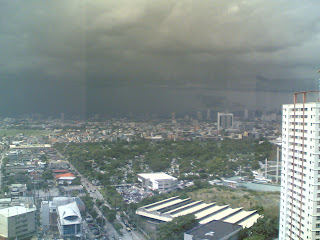 and there was no typhoon yesterday, only an ITCZ. Notice how quick some media outlets suddenly become silent of their daily "water crisis" headlines. All they need is 2 hours of rains to shut them up with their "crisis" alarmism. The country’s media outlets were bombarded this week by “water crisis”, “water woes to get worse” and related stories. Some friends asked me if the current water deficit in Metro Manila is due to global warming and man-made climate change. My quick answer is NO. There is no global heat wave, there is no extension of the most recent El Nino, and there is no postponement to the forthcoming La Niña. 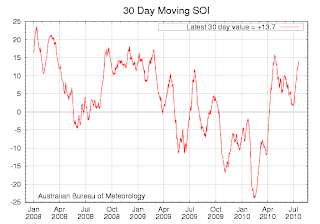 Below is an update, as of July 19, 2010, of the Southern Oscillation Index (SOI) in the Pacific Ocean. 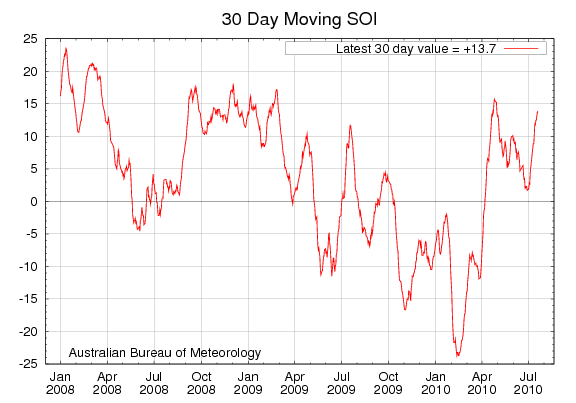 An SOI of -8 or lower means El Niño while an SOI of +8 or more means La Niña. The region Nino 3.4, where the Philippines is, has also shown 0.4 °C cooler than normal for June 2010. If we also look at the global temperature of the lower troposphere (about 8 kilometers above the surface), is there truth to “worsening man-made warming” and hence, “more frequent water crisis” claims? Here is a graph of global temperature anomaly of the lower troposphere, satellite data from the University of Alabama in Huntsville (UAH), 1998-2010. Red fluctuating line is monthly temperature data, green straight line is the linear trend. There was no significant warming in the planet after the big El Nino in 1998. 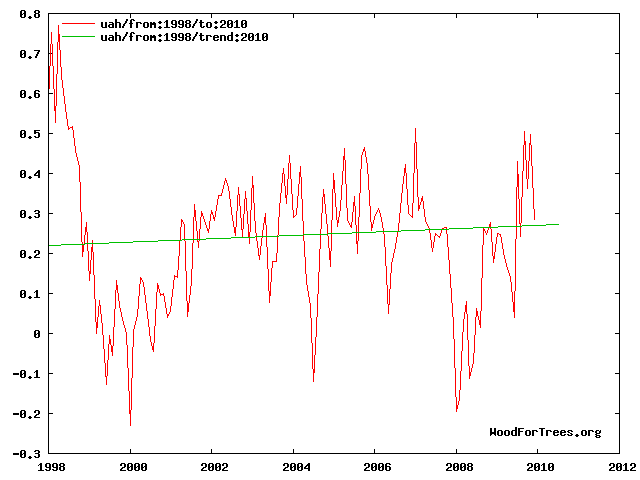 The global cooling in 1999 to 2001 was repeated in 2008 cooling. And with the current trend in decline in global tropospheric temperature and sea surface temperature, another round of global cooling – and severe rains in the tropics and severe winter in the northern and southern hemispheres – is expected starting this month up to the next few years. 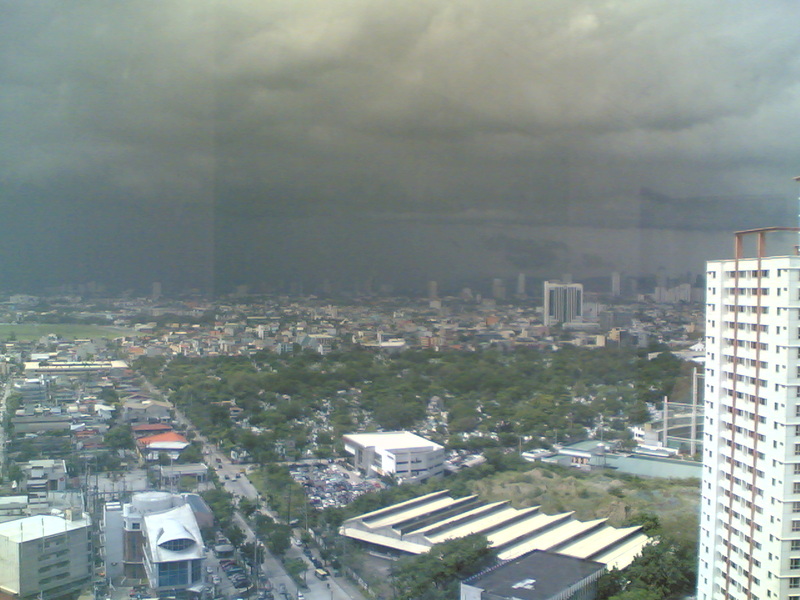 So, should the President declare a “water crisis calamity” in Metro Manila and the neighboring provinces? Aren’t the long lines of people in certain areas of the metropolis enough proof of how serious the crisis is? No, there is no crisis. Per projections by the water companies in the metropolis, if there will no sufficient rain to fall until September this year, it will become a full-blown crisis. Meanwhile, how to solve the water deficit in some areas of the metropolis? Perhaps the quicker solution is for some sharing of water by Manila water and Maynilad water for now. Then wait for the rains in the coming weeks and months as the two graphs shown above clearly indicate of falling temperatures both in the atmosphere and the ocean. There is no global warming. The water "crisis" in the metropolis is more of an engineering problem, not a climate problem. For instance, there seems to be a lack of dams to catch excess rain water during the rainy season in the country. When I go to the US, my plane passes by Japan. I observe from my window that in the mountains of Japan, a single river would have up to seven dams to temporarily impound the water. So that for one river system, there are five to seven water catchment areas with a huge total volume of water supply. Here in the Philippines, there seems to be only one or two dam/s to catch and impound water from rivers. One long-term solution, therefore, is to build more smaller dams upstream, to have more water catchments in the mountains. This will (a) reduce flash flooding during the rainy season, and (b) impound water for multiple uses during the dry or summer season, like irrigating upland farms. Those dams need not be government-owned and operated. They can be owned and operated by the water concessionaires which have long-term water supply contract with the government. So there is no pressure on public finance. 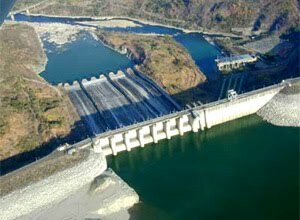 There were also reports that there was an excess release of water from the dams last December 2009, equivalent to almost three months of water consumption in Metro Manila. Such mistake should not be repeated again. Current water supply deficit in Metro Manila and nearby provinces is part of the water supply deficit - excess – deficit – excess natural cycles. What the public should worry is the excess in climate alarmism that find their way in more environmental regulations, more carbon taxation, more climate bureaucracies being created, and endless global climate meetings that are funded from taxpayers’ money. A good friend, Dr. Alvin Ang, Professor of Economics at the University of Santo Tomas (UST), the oldest university in Asia -- it will turn 400 years old next year -- is among the first persons that comes to my mind if I have visitor-friends from abroad who are great free marketers. Alvin used to be the Director of UST's Social Research Center (SRC). 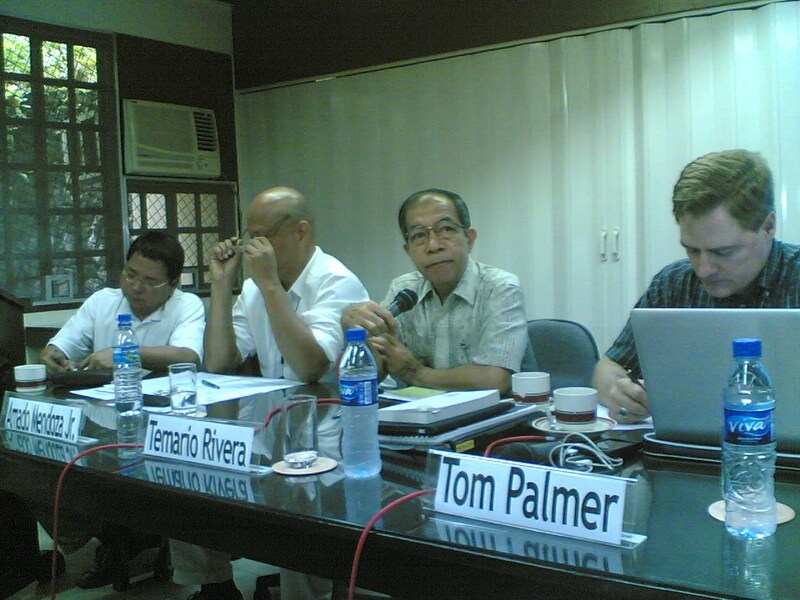 Now he is the Director, Research Cluster for Cultural, Educational and Social Issues of UST. Upon seeing Tom Palmer's credentials, Alvin contacted another department in UST and a student organization to help co-sponsor Tom's talk. The Social Sciences Department, SRC and the Artlets Economics Society jointly sponsored the event, in coordination with Minimal Government Thinkers, Inc. The venue was big, some 200+ students of Economics, Political Science and Philosophy came. Tom's presentation was entitled "Liberty, limited government and the rule of law in the wake of the global economic crisis," downloadable at www.minimalgovernment.net. 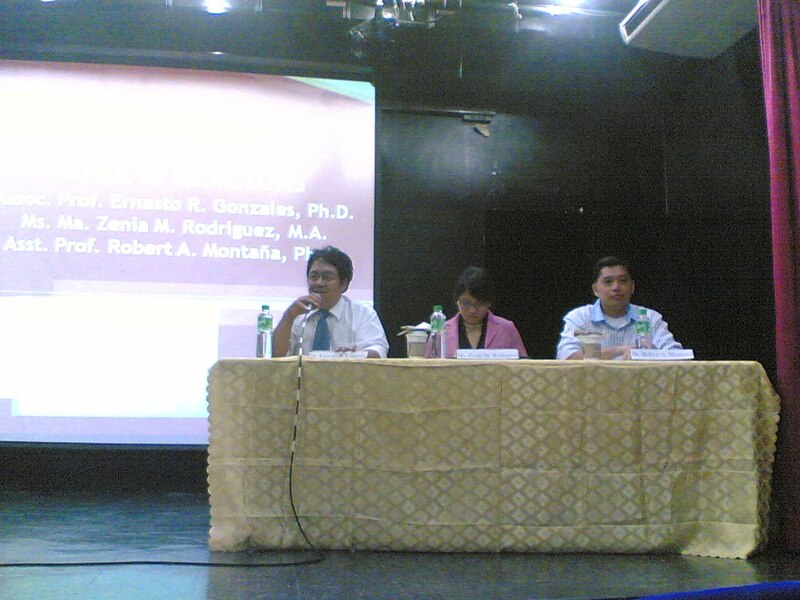 The reactors were Dr. Ernesto Gonzales of Economics Department, Dr. Robert Montana of Philosophy Department, and Prof. Zenia Rodriguez of Political Science Department. A number of students asked both practical and theoretical questions. Great young minds at UST! Below, Alvin gave the certificate of appreciation to Tom. Looking on was Dr. EJ Lopez, also a faculty member at the Economics Department. Hats off to Alvin's leadership, other faculty members' support and UST students' intelligent participation. 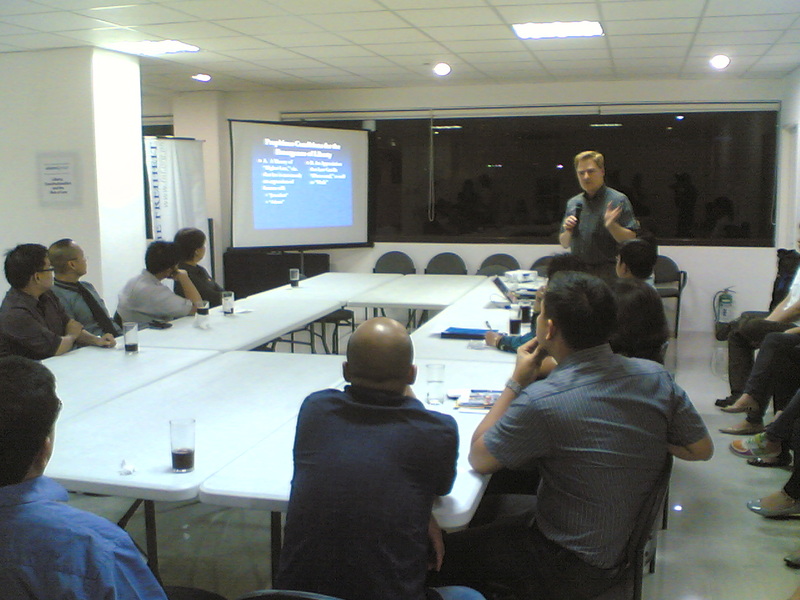 After the talk at UP in Quezon City, we proceeded to Makati City for Tom's talk at the Friedrich Naumann Foundation's (FNF) new office at 7pm. 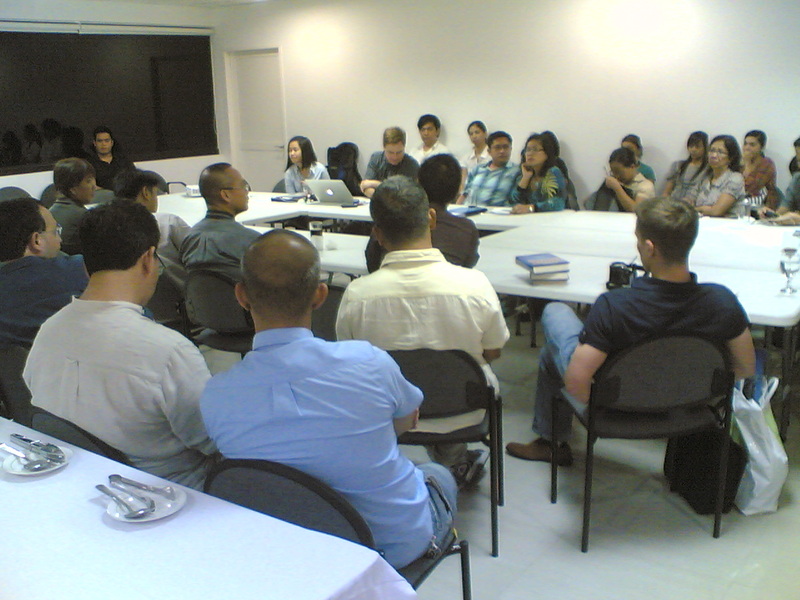 FNF Manila invited the alumni of the International Academy for Leadership (IAF), those who went to Gummersbach, Germany for its various international seminars. Yes, a big number of people came, could be 50+ including some FNF staff and some university students. Tom's topic that evening was "Liberty, constitutionalism and the rule of law", 42 slides of heavy political theory, available at www.minimalgovernment.net and at www.fnf.org.ph. Here's one of the slides. That's why the audience were hooked listening to him. With Chito Gascon, a high official of the Liberal Party (LP), the political party of the new President of the country, Noynoy Aquino. 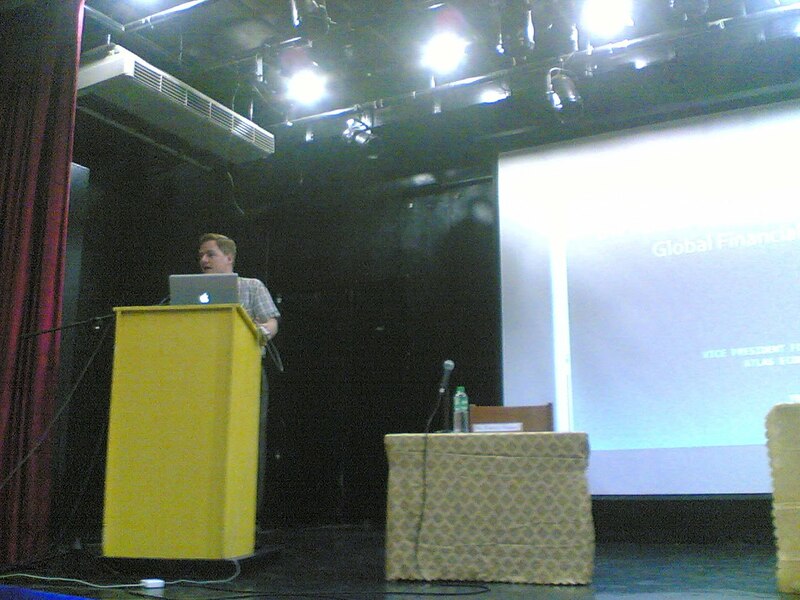 Tom Palmer's first speaking engagement in Manila, also his first time to visit the country, would be at the University of the Philippines (UP), jointly sponsored by the Third World Studies Center (TWSC) and Political Science Department, July 15, 2010 4pm. 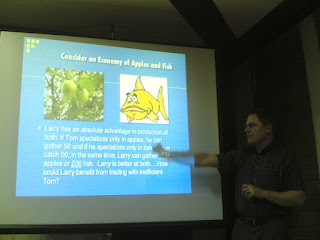 I gave a short message before Tom's lecture. I said that I learned Marxism and hatred of the market in the early 80s at the TWSC and as a Pol. Sci student in UP, from Profs. Alex Magno and Temy Rivera, two of the reactors that afternoon (audience laughter). But I abandoned the philosophy several years ago, I have embraced free market, more individual freedom philosophy. But since I am not really a good speaker, and upon learning that Tom will be going to Manila, I suggested to some friends at TWSC and Pol Sci department, if they are willing to organize a talk for Tom. And that's why we were gathered that afternoon. 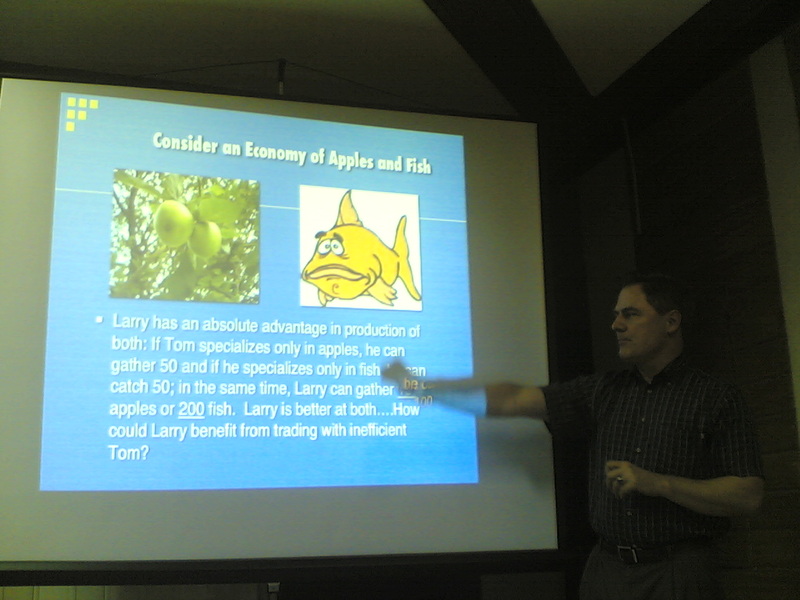 Here is one of his slides where he explained the beauty of free trade and the concept of comparative advantage. Could be 50 students and staff attended the lecture including those who came late. Mostly political science students, graduate and undergrad. Tom's 32-slides presentation, "Individual rights, property and free markets", is available at the MG Thinkers website, www.minimalgovernment.net, also at the http://uptwsc.blogspot.com. A known libertarian intellectual, Dr. Tom G. Palmer (www.tomgpalmer.com), Vice President for International Relations of the Atlas Economic Research Foundation (www.atlasnetwork.org) and Senior Fellow at Cato Institute (www.cato.org), came to Manila late last week. 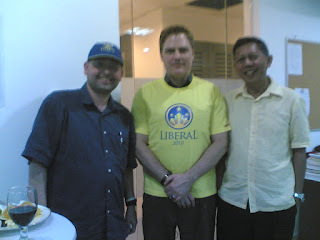 Tom has been visiting a number of Asian countries to meet new people, especially liberty-oriented guys. More than a month ago, he went to 3 Central Asian countries -- Kyrgyztan, Tajikistan, Afghanistan. This month, he visited Japan, Philippines and China. His schedule in Manila was last July 15 to 17, flying out on the 18th (yesterday) to Xiamen, China. His aide, Jude Blanchette, accompanied him. Jude asked if I could arrange for Tom's schedule on July 15 and 16. 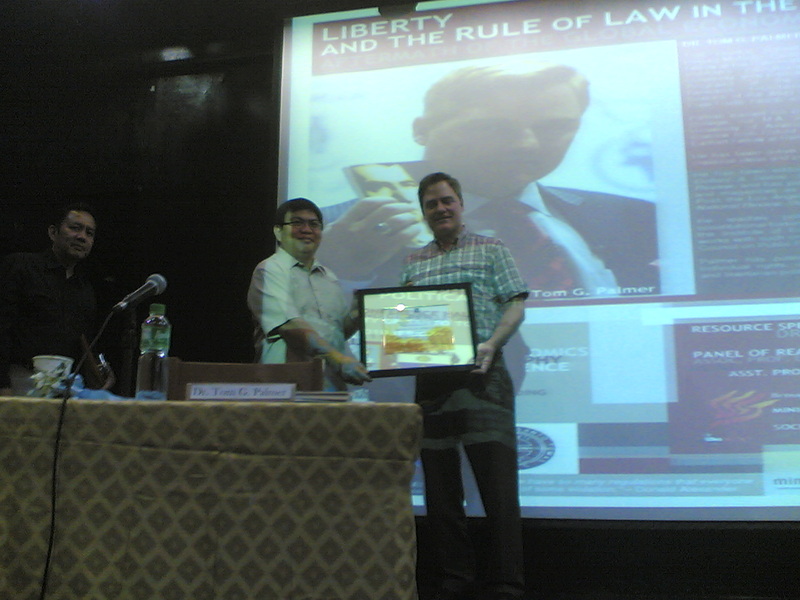 I thought of bringing Tom to several universities in the Philippines to talk about individual liberty, free market, rule of law, and related topics. Below are the places that I arranged for Tom's talk. 1. July 15, Thurs, University of the Philippines (UP) Diliman campus. "Individual rights and free market"
"Liberty, Constitutionalism and the Rule of Law"
"Liberty, Individualn rights and Rule of law in the aftermath of the global economic crisis"
"US crisis, the role of bail-outs and free trade"
1. TWSC and Pol Sci -- Dr. Ela Atienza, Director of TWSC and Professor of Political Science, and Elinor, TWSC staff. 4. UA&P -- Dr. George Manzano, Professor of Economics. I will post more details about the above events in the coming days. 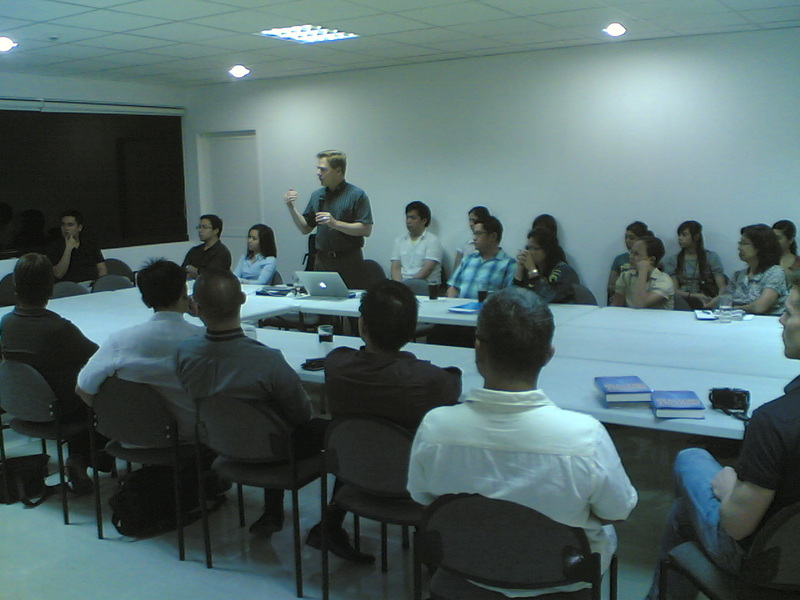 And thanks again, Tom and Jude, for visiting us in Manila. Tom's theoretical discussion about individual rights, limited government and free market were very enlightening to the audience, especially to university students. Last week, I received an email interview from the online editor of BusinessWorld, asking my opinions about the creation of a new agency, the Department of Information and Communications Technology (DICT). Right now, there is Commision on ICT (CICT) and some sectors want to make this a bigger bureaucracy, hence convert it into a DICT. Here is the new report today. I was mentioned in the latter part of the story. I simply argued that we do not need a new bureaucracy. Many people think that when a problem comes, the solution is to create a new government bureaucracy, or to expand an existing one to a bigger bureaucracy. Almost two weeks have passed since President Benigno Simeon C. Aquino III held a press conference to name his Cabinet members. When it comes to his pick for the country’s next information technology honcho, however, the new president has kept his silence. “[The CICT is] below Cabinet. There is [still] a debate whether to transform it into a department. There is a pending measure in the legislature transforming it into a department level position,” Mr. Aquino said during the press briefing. The Commission on Information and Communications Technology (CICT) is a transition agency pending a resolution over the Senate Bill 2546, which seeks to create the Department of Information and Communications Technology (DICT). The CICT was formed in 2004 through an executive order of former president Gloria Macapagal-Arroyo. Its creation brought together the National Computer Center of the Department of Science and Technology (DoST), the Telecommunications Office (TELOF) and the communications units of the Department of Transportation and Communications (DoTC). Despite the clamor for its enactment from the private sector, led by the foreign chambers and the top industry groups, and despite the fact that Mrs. Arroyo certified the bill as urgent, it was never passed at the Senate before the last Congress ended last February. The bill’s counterpart in the lower house was already approved in 2008. In a briefing held at the Malacañang last week, CICT chairman Ray Anthony Roxas-Chua III said most of the employees of the agency would continue to work while awaiting for new directives from Mr. Aquino. Two days before the presidential inauguration, two of the agency’s top officials, Mr. Chua and CICT commissioner and National Computer Center director-general Angelo Timoteo M. Diaz de Rivera said they were ready to return to the private sector should the president appoint new officials. With even the CICT at a standstill, the industry can only wait to see whether the Aquino administration puts a conclusion on one of the local technology sector’s longest-running sagas. In an interview, TELOF executive director Graciano Sitchon said that now is the best time to review the proposal for DICT creation. “There could be something wrong in the way the bill was packaged [which could explain] why it has not yet been passed,” Mr. Sitchon said. Among others, he said the supposedly anomalous $329-million national broadband network deal (NBN) with China’s ZTE Corp. has made it difficult for the bill to be enacted with both the public and politicians wary about technology-related transactions. The NBN proposal has its roots in the vision of linking government agencies nationwide through a network which the CICT was espousing in its nascent days. There was also the lack of appreciation by the Congress on the vital role that the proposed department could play in improving the economy of the country, said Maricor M. Akol, IT practitioner and president of industry group IT Foundation of the Philippines (ITFP). Proponents of the DICT have repeatedly argued that most developed and progressive countries have DICT counterparts. Ms. Akol surmised that the bill failed to get the Senate’s attention because there were “too many lawyers and a lack of technocrats in Congress,” adding that the “inability of CICT to come out with more convincing and pressing arguments to an disinterested Congress” was also a factor. Meanwhile, groups lobbying against the creation of the DICT stressed that even without the department, the industry has been able to grow. To illustrate, the business process outsourcing (BPO) sector, which started its ascent in 2000, has grown to become a $7.2-billion industry employing a total of 442,164 workers as of 2009, according to government data. Mr. Oplas is the president of Minimal Government Thinkers, Inc., a group that proposes minimal government intervention in business. “The government bureaucracy should shrink and be reduced, not expand. Each new bureaucracy that is created or expanded means new taxes and fees that need to be created or expanded. And each new bureaucracy means new politics from the executive to the legislative branches,” he added. More than overseeing the business sector, she said the proposed DICT should be on top of the government’s use of technology, which is considered as the single biggest user of ICT. "Can he do it? There’s the rub. He can do it only if we are with him every step of the way—looking over his shoulder and those of other officials, breathing down their necks, exercising countervailing power on business lobby groups, and making sure we toe the line, too. (Who do you think does the corrupting?)" The governors and the governed, the administrators and the administered, have intertwining relationship. Governors and administrators can be corrupt if the governed will allow it. But beyond pushing people, us, to be "vigilant" of what the government is doing, I would still encourage or remind my fellow private citizens that government is us. The elected and appointed officials and bureaucrats are imposed upon us but the real challenge is on us as responsible individuals and parents or guardians. Do we allow our kids to become drunkards and drug addicts then we run to the government later so that government will heal our kids from liver cancer and drug dependence? If parents and individuals are responsible enough, we need less external government. Instead, we need more "internal" government -- within us, within our voluntary organizations (from our sports club or civic club or alumni association or church group, etc.). In one of my discussion yahoogroups, there is an exchange about when a new administration will fail or not. In this case, the administration of the new President of the Philippines which was inaugurated just two weeks ago. I think one potential failure of the new Philippine government is huge borrowing due to climate alarmism. The Asian Development Bank (ADB) -- and WB, UN, EC, etc. -- climate alarmism is earning it (them) big money. To convince the RP govt to borrow $1B, or is it $10B to "fight global warming" is no different from a drug pusher, pushing loans to fight a non-existent enemy. Those are loans, not grants, that will be paid many years from now, and those are not just a few million $ loan but multi-billion $ loans. There are many ways to contribute to new government failures. And foreign aid is one of them. The other side of the “heavily-indebted” countries in the world, somehow, are the “high foreign exchange (forex) reserves” courtries. Although many countries with high forex reserves also have high foreign debt, especially their private corporations and financial institutions. Below are some recent data. * excluding gold, except Singapore and China. Note that out of the top 10 countries above, 8 are from Asia (including Saudi Arabia), especially the Confucian Asia-5: China, Taiwan, S. Korea, Hong Kong and Singapore. According to Standard Chartered Bank, the combined forex reserves of ASEAN’s 5 biggest economies (Indonesia, Thailand, Malaysia, Singapore, Philippines) were $452 B by end-2008, $518 B by end-2009, and $545 B by end-May 2010. These are significant amount of money that can help stabilize an economy in cases of uncertainties in global finance. Governments, like individuals and households, should learn to save and live within their means. If the projected revenues (taxes, privatization proceeds, income from some state enterprises) are low, then expenditures like various government subsidies should be kept low too. Among the teachings of the great Chinese philosopher, Confucius, savings and frugality is a virtue. And living beyond one's means is wrong. This is something that the governments of G7 countries and many other countries, need to keep in their minds. Responsible and frugal government will be a good inspiration for the citizens. A statist view is one arguing that things and social processes, as much as possible, should be done by the State and not by individuals, households, their voluntary organizations, or private enterprises. This view therefore, belittles if not removes the role of personal and parental responsibility in running our own lives, our own households, our own community. There is an often-quoted phrase, “more popish than the pope”, to refer to persons and institutions who seem to be more fundamentalist in Catholic belief than the Pope. The phrase “more statist than the state” may as well apply to people who seem to be more fundamentalist in their belief of the big role of the state than the administrators of the state itself. In my personal observation, these “more statist than the state” individuals and leaders have certain characteristics. One, they are seldom found in mainstream political parties. 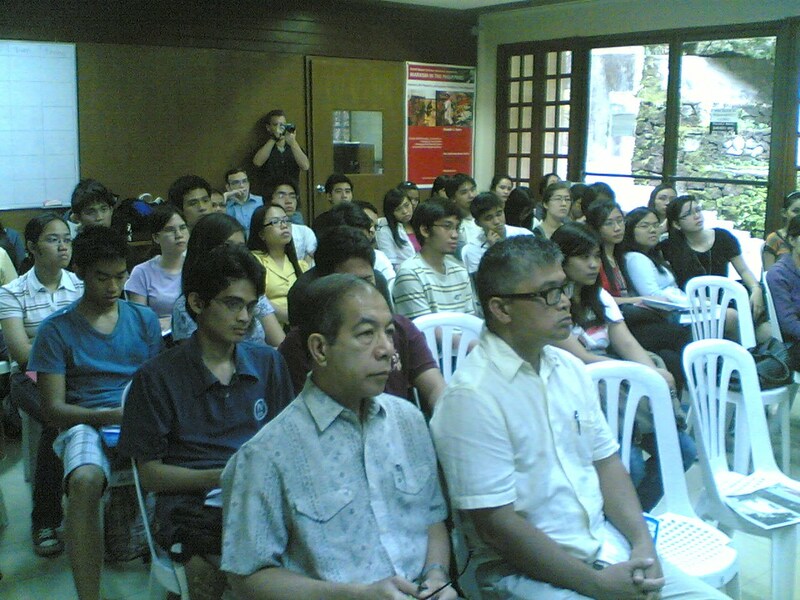 Rather, they are found among mainstream NGOs and civil society organizations (CSOs), media and the academe. Check for instance the paper, “Why do intellectuals oppose capitalism” by Robert Nozick, and I wrote a brief discussion about the paper here, http://www.minimalgovernment.net/media/nozick.pdf. Two, these individuals and leaders are obviously driven by socialist belief and deep hatred of the profit motive and social inequity under capitalism. But they do not belong to a Socialist or Communist political party. Rather, they espouse socialism on a sectoral basis. Like health socialism, education socialism, ecological socialism, land redistribution socialism, and so on. Four, one will seldom or never hear from them the words “personal responsibility.” As almost everything is “government or state responsibility”, then there is little role for personal and parental responsibility in running their own lives. The state should allocate v percent of GDP for education, w percent of GDP for healthcare, x percent for environmental protection, y percent for food security, and so on. They may not be explicit in advocating for central planning but that is exactly what they want the state should do. Five and a corollary to #4 above, one will seldom or never hear from them the advocacy for individual liberty and individual rights. What is paramount for them are national and collective freedom and collective rights. 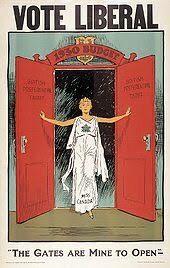 Individualism is taboo and the individual can only realize his/her growth potential if the collective is well-taken cared of by the political administrator of the collective, the state. As a former Marxist-socialist myself more than two decades ago, it is somehow easy for me to identify such kind of attitude as I used to harbor such sentiments too. And having abandoned that statist philosophy several years ago, I have learned to embrace the value of individual liberty and its sacredness not to be subsumed most of the time under collective liberty. People should assume more personal and parental (or guardian) responsibility in running their own lives, their own households and communities, if they wish to realize more individual freedom. Freedom and responsibility are two sides of the same coin. At the end of the day, fear of responsibility is fear of freedom itself. The term “Civil Society” is used with many different meanings in the political discussion at different political levels. In our context, we are only concerned with the local level and the idea of a liberal civil society. Inhabitants and citizens of a community generally have to accept specific restrictions in their individual freedom to guarantee peaceful living within their community. They agree to these limitations and accept the given laws, decrees and regulations in a wide range, which are set up by their local government. allowed, but in many cases, what is allowed or what a citizen can do. Through these networks of regulations, the administration tends to limit the citizen’s responsibility for acting and, at the same time, takes away certain aspects of his or her personal freedom. And this can happen in a way which exceeds necessary limitations by far. But an individual can only keep his dignity through personal responsibility. Therefore the citizens in a community need to trust each other, so that all individuals are able to act and live without unnecessary regulations affecting their freedom or self-responsibility. This is the image of a liberal civil society, to live in a community/municipality with as few regulations as necessary. However, a liberal civil society is characterized by an active citizenship where each individual feels responsible for the general public, demonstrated through free activities, voluntary co-operation and work, as well as taking responsibility. This ideal image of a broad self-responsibility requires as many ways of influencing the structure of the local government. The Swiss model with a high degree of plebiscitary elements is one example of such a model. are some visible ways of increasing citizen’s participation. Such means to improve public participation can be found in the work fields of “city development” and in some cases through the setting up of the municipality’s budget, which can be called the citizen’s budget. We can imagine that this can be extended to many more areas of citizens’ participation initiatives. From a liberal perspective, the goal of municipal politics has to be that voluntary and private initiatives dominate the public life, and public administration only intervenes for subsidiary reasons. But we know that today this is just a vision. 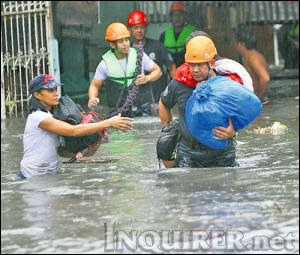 The SC to "compel" LGUs to construct anti-flooding activities? This is too statist and dictatorial. And to think that the warmer-leaders are preparing for "unequivocal" global warming, of melting polar ice and rising ocean and temperature rise of up to 6 deg C just 90 yrs from now. Severe rains and severe winter are symptoms of global cooling, not global warming. 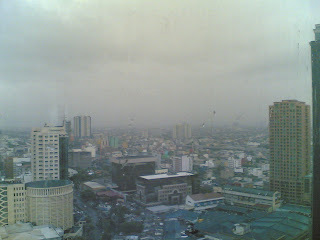 A friend asked, should the SC compel the LGUs instead to buy heaters due to the coming global cooling? That's another statist and dictatorial move. The SC or any other national government body should NOT compel the LGUs or anyone to buy anything. We need to adapt either in global warming or cooling. But carbon regulation has zero impact on it. The Sun, the ocean, galactic cosmic rays, volcanoes and other natural factors, are the main regulators of the Earth's climate. So why do we need carbon tax and trade? It's a multi-billion dollar robbery scheme. Carbon cap and trade in 2008 alone was worth $128 B, even with zero participation yet by US companies and government. The five regions in China covered by the study are NorthEast (NE), NorthWest (NW), Tibet, Central East (CE) and South-East (SE) China. The medieval warm period (MWP) that occured about 800 yrs ago, as well as the little ice age (LIA) that occured some 400 and 200 yrs ago, were confirmed by their data. 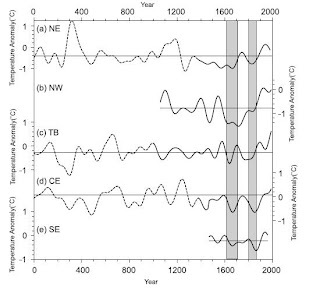 Almost zero industrial emission some 800 yrs ago and yet global temp was much warmer than the past century's warming. How come? Because CO2 emission is never the main factor for climate cycles of warming-cooling-warming-cooling. Michael O'Leary, the airline's chief executive, will set out proposals today that include charging customers to use the loo. 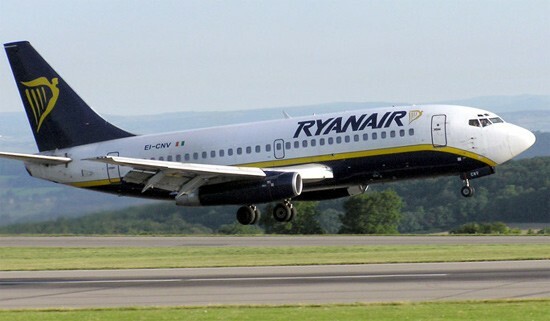 A standing area with "vertical seats" will be introduced at the back of its fleet of 250 planes. This is an interesting development in the process of capitalist competition in the airline industry. The competition among many airlines is pushing companies to provide more varied services at varied prices. Market segmentation works always. Those who want full comfort, they get business class seats and pay high. Those who economize, get economy class seats and pay the standard rates. And for those who want to economize further, get standing room ticket and pay even lower. There is a market for everyone, rich and poor, producers and consumers. That's the beauty of free market capitalism. People accept inequality and they do not call for a revolution in order to have "equality for all." Governments, upon the prodding of the bleeding-heart groups, usually come in to correct the "market failure" of social inequity. And that's where waste, inefficiencies and corruption occur, and people's dissatisfaction in society and governments. After the inauguration of the new Philippine President last June 30, the Philippine National Police (PNP) leadership announced that no more civilian sirens or “wang-wang” will be tolerated. Only the top five officials of the country are authorized to have it, and ambulances, fire trucks, police cars can use their wang-wang only on emergencies. This is a good news for ordinary citizens and motorists. Those loud and blaring sirens by civilian cars, or private vehicles escorted by police motorcycles and cars with blaring sirens, are clear and loud examples of the rule of (politically-influential) people. In facebook, a new identity was created, “Isumbong mo ang wang-wang dito” (“Report those sirens here”). I think it was created only last June 30. By midnight of July 1, it has attracted 7,000+ fans who liked it, including me. It is a big number, and it shows how exasperated the Filipinos are in seeing serious changes in government. The comments by people who “liked” it are both serious and funny. A number of fans of this site have reported the vehicles – plate number, model, when and where they were seen – which have wang-wang. A few posted pictures and/or videos. Since facebook has millions of fans and account holders among Filipinos, both in the country and abroad, it should be shameful for the owners of those vehicles that were caught and reported to be blaring their wang-wang until now. 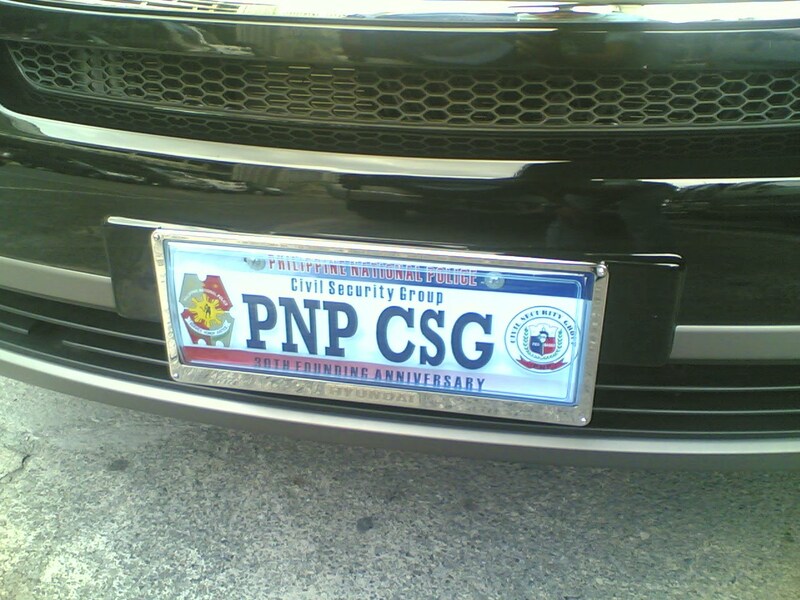 The government should not only run after those vehicles with wang-wang, the government should also discontinue and dishonor special car plates that exempt those cars from the number-coding in Metro Manila. 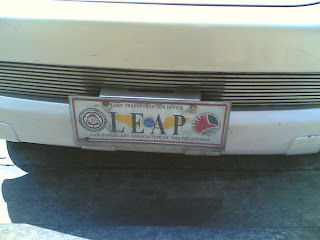 Such car plates include LEAP, PNP-CSG, Lead-PNP, PNPA-PMA, others. Government officials and employees should properly understand the meaning of the “rule of law”: rules are rules, no one is above the law, no one is exempted from the law, and no one can grant exemption from the law. Having wang-wang, special car plates, car stickers and/or IDs that bear the logo of a powerful government agency, is a short-term and short-sighted solution to heavy traffic problems in the metropolis. Instead of addressing certain cultural and engineering problems that cause heavy traffic congestion, those people use politics and political connections in bailing themselves out of the regular and daily misery that average citizens and motorists experience. Once we as a people learn to respect the laws and prohibitions, both governors and governed, administrators and administered, politicians and voters, we can expect economic progress and better peace and order in society. If no one steals or kills, then the people’s entrepreneurial energy and potential will be unleashed. People can work until midnight if they want, and not worry that some criminals may be waiting for them when they go back home, or criminals that may victimize their family members and friends while they are working. 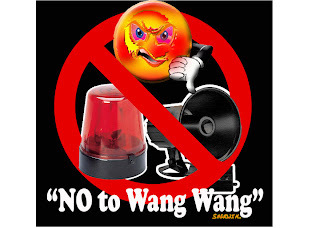 The “no more unauthorized wang-wang” program of the new administration is a simple but concrete step to remind people to respect the rule of law. 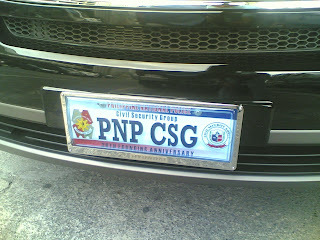 To respect the Office of the President and the various law enforcement agencies under it. Let us hope that the new government will keep this and related policies until the end of its six-years term. By then, self-discipline should have permeated into the hearts and minds of the citizens. Awareness of personal responsibility and respect for individual rights and individual freedom should have filtered through the hearts and minds of the citizens; young and old, rich and poor alike. Then we shall be proud once again of the Filipino. As a race, as a nation, as a people. To keep a free society, it is better to have many voluntary associations and each association will have its on set of rules and "laws". A cycling club or badminton club or rotary club, for instance, will have its own set of constitution and by-laws, with rules that need to be folllowed and there are penalties for not following the rules. Like being kicked out of the club for not paying the annual dues, for not reaching the minimum number of attendance in meetings, and so on. The law on anti-Violence Against Women and Children (VAWC) would fall into that category. Although it was the State, through the legislative branch, that crafted and enacted that law, its enforcement is delegated to the micro and household level, and not so much to the state police and bureaucrats. In such situation of voluntary associations, say a labor union or a sports or civic club or a church group, the individual can opt to get out. The beauty of this is that such voluntary associations which were created to improve the condition of their members (to become good cyclists, to become good tennis players, good community leaders, good religious and lay leaders, etc. ), live on voluntary support by members. If the members find their voluntary organization/s not worth supporting anymore, that association will die a natural death. No taxes and fees needed to bail them out. No rallies by affected employees and bureaucrats who will lose their job. And if a voluntary association performs well and caters to the expectations of members, then such association will thrive and expand. Despite the fact that such voluntary associations will soon have a long set of rules and regulations as they grows bigger and bigger. The point is that individuals have the option to get out and discontinue paying the financial contributions, attend meetings and organizational or club activities. It is on laws crafted and institutionalized by the State that can create more damage to society, if such laws and prohibitions become plentier and more complicated. Because individuals cannot opt out, unless they will ask for political favors like exemption from the application of the laws, which is tantamount to corrption and the rule of men. Or an individual can migrate to escape the multitude of laws and prohibitions in his home country.